A Seven Year free-for-all involving all the major powers of Europe, including old adversaries England and France, included heated battles in North America. In what was to later be known as Canada, the end came with the capture of Quebec City on September 13, 1759, and the fall of Montréal a year late. Defeated, in the 1763 Treaty of Paris, the king of France, Louis XV, handed over French possessions in North America, including Quebec. King George III of England was happy to oblige. But the colony of Québec, which included Quebec City, Montreal, Tadoussac and Trois-Rivieres had over a hundred years of civil law tradition and French language. By 1763, and since 1664, French North America had been regulated by the 1580 version of Paris civil law known as the Coutume de Paris. With a paternal attitude, the English believed they were doing Quebecers a favour when they announced that they would henceforth be bound no longer by French civil law, but by the British common law. This, all under a new centralized colony, called the Province of Québec. The territory of Québec, at the time, was immense. Other than a wide swath of land along the Atlantic seabord reserved for the fledgling America colonies, Québec stretched all the way down to include present-day Florida; and West wrapped around the Great Lakes as far as present-day Manitoba (it was only in 1791 that an English and common law jurisdiction of Ontario was cut out of that territory, then called Upper Canada). When the Royal Proclamation of 1763 was read aloud in the French colonies along the shores of the Saint Lawrence River, the English words burned the ears of the French population. At first, there was little room to complain, intimidated by several years of military occupation and strict martial law. But eventually, the population took to formal protests, appeals to London and even open hostilities. The first response to the protests was to wait them out; to bide time to let the French in Quebec come to terms with the common law. Essentially, the British ignored the repeated appeals from Québec to revert Québec to civil law. But when the first sparks of protest began to fly from the American colonies to the South, there was more than enough motivation to appease the French North Americans. In 1775, the Quebec Act was passed in the British Parliament in London and the political victory was almost total: the civil law was restored in Québec. British common law is based on an interpretation of ancient customs as opposed to the heavy reliance of civil law upon the tried, tested and true principles Roman law. 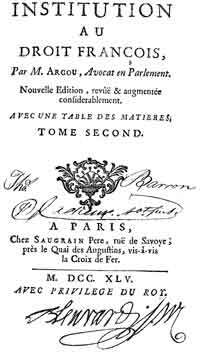 But in 1763 and even in 1775, the French civil law was also based on local customs, albeit those of ancient France and all under the unifying influence of Roman law. In the Quebec Act, two exceptions were made for the British common law. In criminal law, the English insisted that common law was to prevail. In commercial law, the trading of goods and the exchange of currencies, even the French were content to see English common law applied. But in their private dealings and the recognition of their personal rights, it was back the Coutume de Paris. In Québec, the French Revolution blew over and continued the separation between Québec and her former mother-country. No significant issue was ever taken with this exception and since then, Québec has been regulated by the civil law including a conversion to a Civil Code, following the example of France's March 21, 1804 version. Quebec politicians were impressed with the 1804 French Civil Code and were alive to the gradual erosion of their species of civil law by the pressure of common law on all their borders. Worse, the civil law in Québec was a smörgåsbord of sources including, for example, Royal decrees from a nation, France, which had since done away with its monarchy. Further, some Royal French decrees had been registered in Québec, others not, and lawyers argued over whether registration was necessary or not for the particular decree to have force of law in Québec. Finally, on August 1, 1866, after decades of research and re-writes of drafts, Québec implemented and brought into force out its own version of a Civil Code, still in force today, albeit with several significant revisions. Beauchamp, J. J., Le Code Civil de la Province de Québec Annoté (Montreal: C. Theoret Editeur, 1904). Lorimier, C. and Vilbon, A., La Bibliotheque Du Code Civil de la Province de Quebec, Volume I (Montréal: Des Presses A Vapeur De La Minerve, 1871).